What are push and pull workout plans? They’re simple but effective ways to get a balanced workout. When someone says, “yeah, I lift”, we often think multiple days in the gym consisting of chest, back, shoulders, arms and the dreaded leg day. That is the “traditional” way to lift, right? Dividing muscle groups into different lift days, although not bad, may not be the best for your body. It can be time consuming and often cause multiple problems. It can cause imbalances by over-training one area over another, especially in opposing muscle groups (like chest and back). Instead, you can try a workout routine that will address all your muscle groups and create a full balanced body that will help you be move better. This can be achieved through Push and Pull workouts where you work on push exercises one day, followed by pull exercises the next. And, the good thing is that you only need to schedule 4 days a week using this approach. 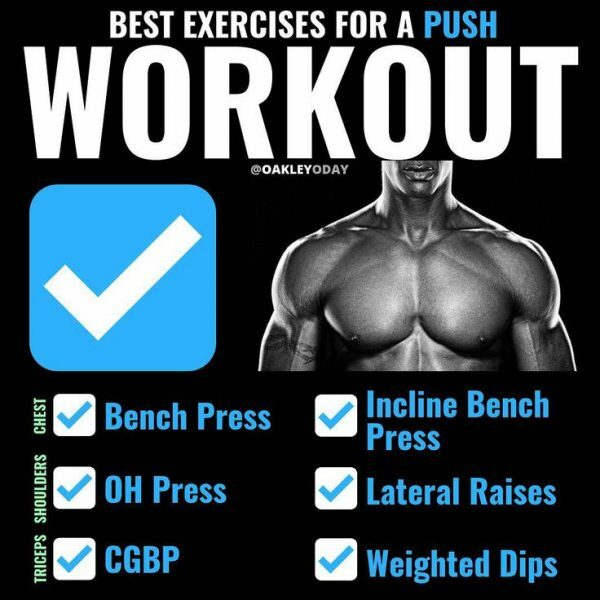 What’s a Push and Pull Workout Routine? A push workout contracts your muscles when weight is being pushed away from your body, meaning the work is done when the muscle lengthens. The primary muscles in a push workout includes chest, triceps, quadriceps, calves and shoulders. Examples of push exercises are push-ups, squats, and the shoulder press. A pull workout is the exact opposite. 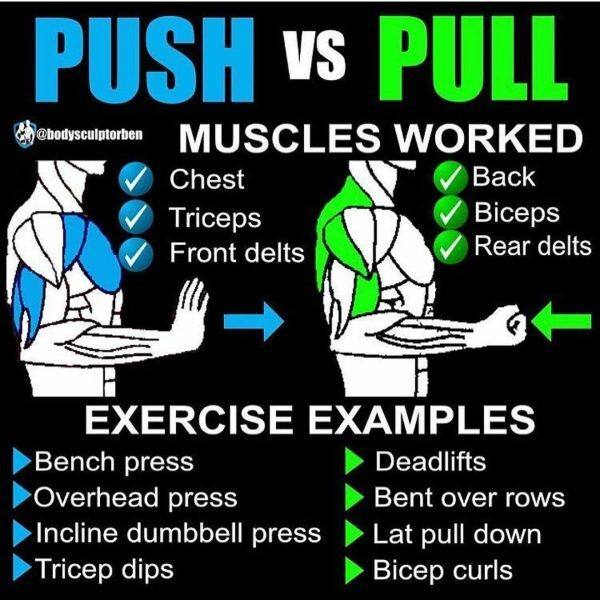 Pull exercises are those where the muscles contract when weight is being pulled towards your body, meaning the work is done when the muscle shortens. The primary muscles in a pull workout includes all back muscles, biceps, hamstrings, obliques and trapezius. 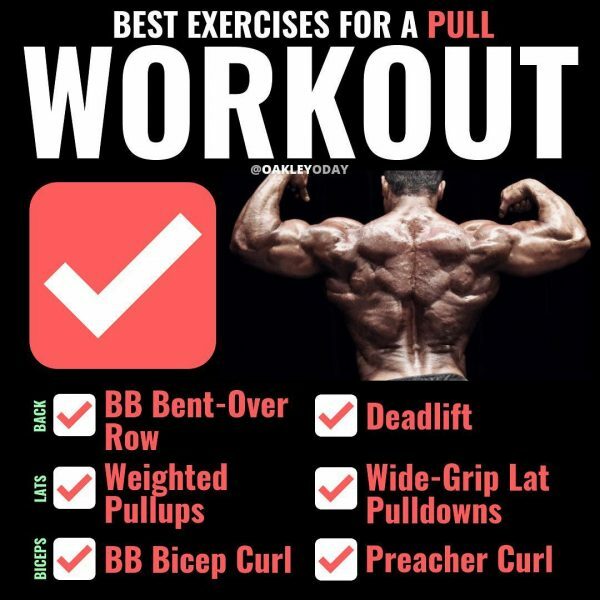 Examples of pull exercises are pull-ups, back rows, deadlifts, rear shoulder flys and bicep curls. Less time consuming (BIG PLUS!) – Less time working out = more time doing other things. Creates muscle balance – dividing our muscles into different days can lead to imbalance. The most common is overworking our chest versus our back creating a hunch in the shoulders and upper back. 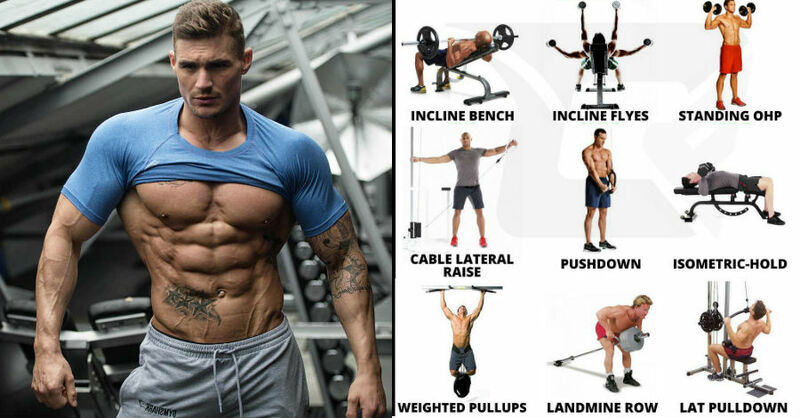 With a simple pushing and pulling workout we create a more balanced physique. Promotes injury prevention – Over training major muscle groups are a common way to injure yourself. Balancing push and pull moves will help you not to overwork and stress your muscles and give you plenty of recovery time between workouts. Doing both push and pull moves the same day. This can be three to four days a week with a rest day between each. Do a push move immediately followed by a pull move. 8-15 repetitions in each set where you pick a weight that is really challenging (while maintaining good form) to lift by the time you get to your goal rep. Schedule by doing all push moves one workout day and all pull moves the next workout day. This can be done 2- 4 days a week (as long as there are both even amounts of push and pull days). So if you do two push days, you must do two pull days. 10-15 repetitions in each set where you pick a weight that is really challenging (while maintaining good form) to lift by the time you get to your goal rep. Adding push and pull exercises to your workout routine will give your body the muscular balance it needs! You will look good, feel better and your body will be moving more functionally! Try it the next time you need to change up that routine!